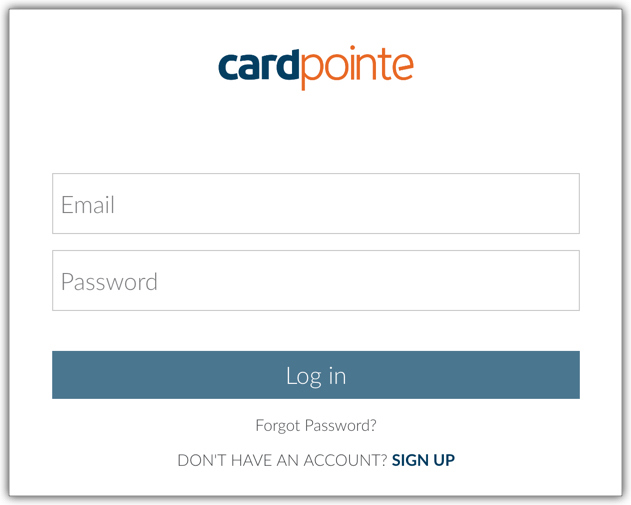 The CardPointe web application offers an intuitive user interface for complete control of your account. Dashboard - Displays transaction activity, recent funding events, funding trends, and notifications. 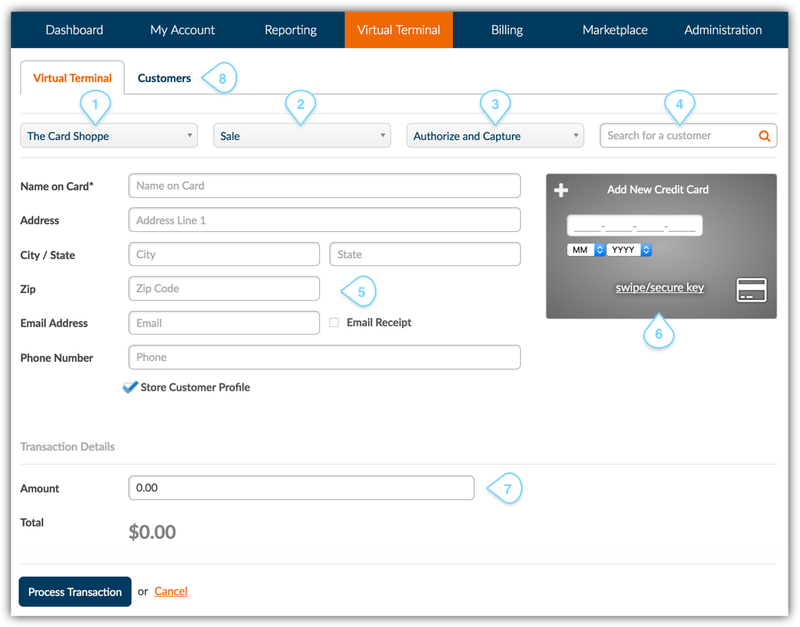 My Account - View your Merchant Accounts, add products, services and hardware, and manage PCI compliance. Reporting - Access transactions, gateway batches, funding events, chargebacks and statement archive. Virtual Terminal - Use the Virtual Terminal to accept card-present and card-not-present transactions. Billing - View and/or create billing plans and schedule payments. 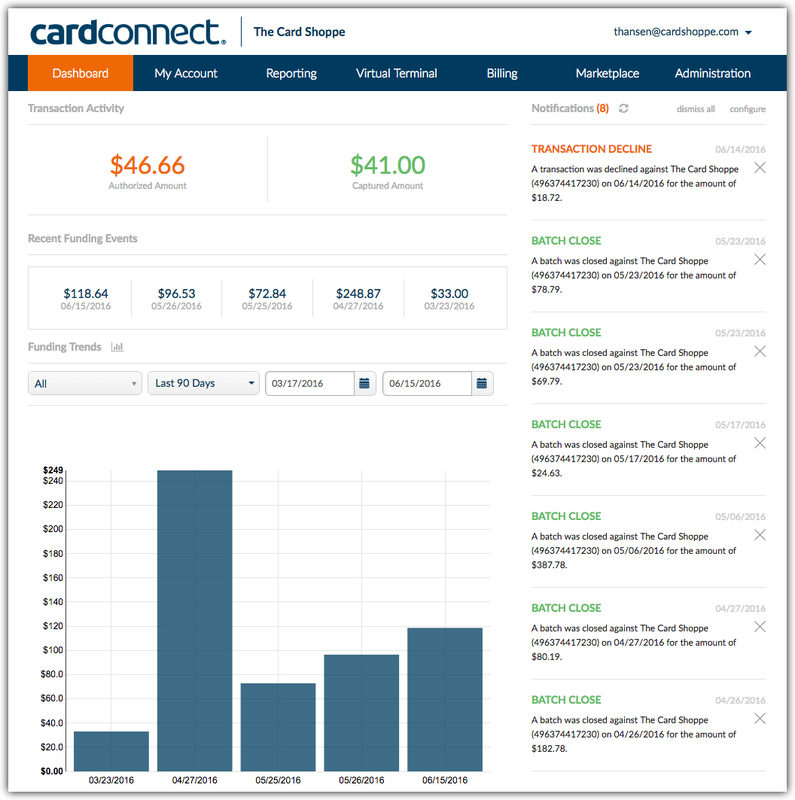 Marketplace - Displays the current product suite offered by CardConnect, which includes (but is not limited to) shopping cart integrations, POS systems, accounting systems, etc. Administration - Manage users, configure the Virtual Terminal, customize receipts, define batch times, and more. 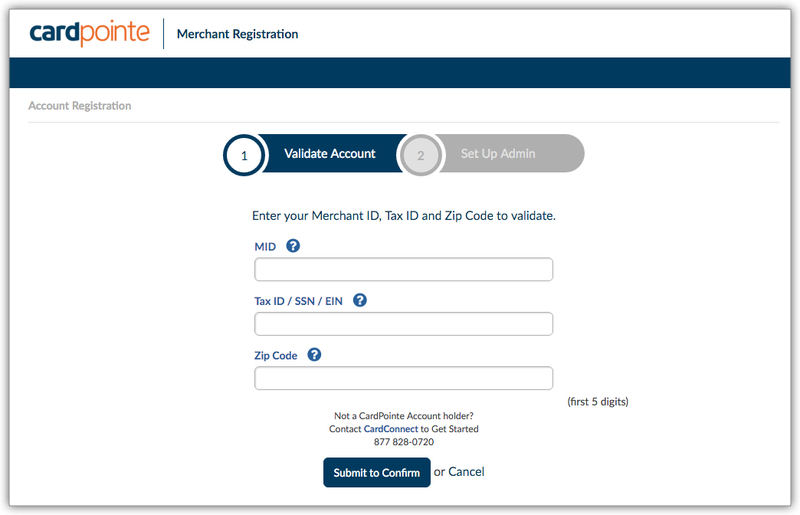 CardConnect merchants can register for CardPointe using the account registration log in page. Enter your Merchant ID (MID), your Tax ID or Social Security Number (SSN), and your zip code in the corresponding fields. Click Submit to Confirm. The Set Up Admin screen displays, allowing you to associate an administrative user with your Merchant Account. Upon completing these fields, click Submit. CardConnect will send you an email that includes a link to complete your registration. Note: The link to finish your registration, which is included in the email that you receive from CardConnect, expires after two weeks from the date of receipt. If you fail to complete your registration prior to this expiration period, please contact CardConnect. Simply enter your account credentials and click Log in. The Dashboard provides a a high-level overview of a merchant's activity. You can easily navigate and view transactional data in addition to any account alerts. You can configure the types of notifications that display on the Dashboard screen by clicking configure. The My Account page provides an overview of a merchant's accounts and their corresponding payment devices. It's easy to sign-up for paperless statements in CardPointe. From the "My Account" screen, simply click the arrow to the right of the account to view additional details about the account. Check the box next to I would like paperless statements. If you have multiple merchant accounts, repeat these steps for each account that you'd like to receive paperless statements for. View a list of your account’s existing devices. Activate a device, which validates the device’s chain of custody for security purposes. Deactivate a device that is not in use. View your account’s equipment order history. Track the shipping status of device orders. Navigate to My Account and click the Equipment tab. Locate the device that you'd like to activate and click Enable. Locate the device that you'd like to activate and click Disable. Navigate to My Account and click the Orders tab. 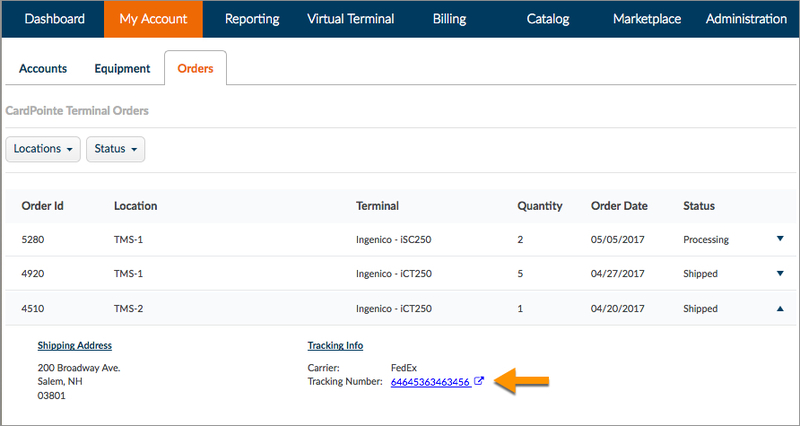 Locate the order that you'd like to track and click the arrow to the right of it. Click the Tracking Number link to view the order's shipping status. CardPointe provides you with a handful of reports to help you get a better understanding of your account-related activity, making it easy to quickly create and download reports. Provides transaction history, including but not limited to transaction number, merchant location, date of sale, payment card brand, transaction amount, and transaction status. Provides batch-related information, including batch number, merchant location, batch amount, batch close date, and batch status. Displays batched deposits funded to your merchant bank account. Deposit specifics in this report include funding date, bank account, the merchant location where the deposit was made, and the actual funded amount. Displays all chargebacks that occurred within your merchant account. Chargeback specifics in this report include but are not limited to merchant location, the last 4 digits of the card used to process the initial transaction, payment card brand, chargeback date, case number assigned, the amount being disputed, and the transaction number. In addition, you can generate statements that provide detailed information about any payments received by the merchant based on a customizable date range. Transactions-based reports provide transactional data—including sales, refunds, forced credits, and payment card verifications—that took place at the merchant locations that are attached to your account. Refer to the screenshot below and the descriptions that follow for navigating the Transactions tab. If this is a new report, clicking Unsaved Report allows you to name and to save the report for reuse. Upon saving the report, the name of the report displays. Clicking Show Filters reveals any filters that are applied to the current report. Location - The merchant locations that are linked to your account. Date - Click to define a date range for the report. Status - Click to choose the transaction statuses that you wish to include in the report. 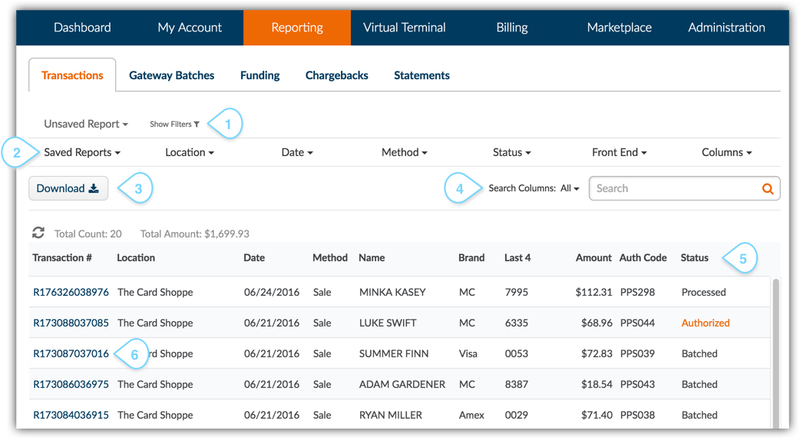 Front End - Click to choose whether you want to view transactional data that was processed through a specific point of interaction, including APIs, Hosted Payment Page, CardPointe, CardPointe Mobile, CardPointe Terminal, etc. Columns - Click to choose the columns to include in the generated report. Clicking Download saves the current report data to your computer as a .CSV (spreadsheet) file. Allows you to search the report columns for specific information or data. Selecting a column header sorts the report data by ascending/descending order. Selecting a transaction number displays the details for that specific transaction. Gateway Batch reports display batch-related information, including the batch number, merchant location, batch amount, batch close date, and batch status. Note: Gateway Batch times are configurable on the Administration screen. Refer to the screenshot below and the descriptions that follow for getting around the Gateway Batches tab. The level of reporting offered by CardPointe varies based on the account configuration or transaction origin. For example, Virtual Terminal and API transactions realize the complete reporting set (Gateway Enabled). Meanwhile, transactions from a third-party device such as Verifone or Clover do not supply Authorization or Batch details (Acquiring Only). The CardPointe Virtual Terminal allows you accept payment cards and eChecks using your computer's web browser and an internet connection. Using the Virtual Terminal, you can initiate card-not-present and card-present authorizations, captures, settlements, voids, and refunds. In addition, you can easily add and securely save customer payment information. If you wish to accept EMV transactions with the CardPointe Virtual Terminal, please refer to the Bolt + Virtual Terminal documentation on this site for more information. Refer to the screenshot below and the descriptions that follow for using the Virtual Terminal. The merchant location that you would like to run a transaction against. This automatically defaults to the first location listed within the Locations section of the Administration screen. Sale - Process a sales transaction. The Transaction Processes available with this option include Authorize and Capture and Authorize Only. Force Credit - Force a credit for processing. This is useful when you wish to offer customers a credit without a receipt or specific proof that they purchased goods from you. Verify - Verify a customer's payment method without authorizing funds (also known as a Zero Dollar Value Authorization). A Zero Dollar Value Authorization performs an Address Verification (AVS) check, and confirms that the three or four digit Card Verification Value (CVV) code is valid. Authorize and Capture - Authorizes the availability of funds from a customer’s payment source, and then transfers those funds from the customer’s account to the your merchant account. Authorize Only - Authorizes the availability of funds from a customer’s payment source so that funds may be captured at a later time. Search for an existing customer profile to associate with a transaction. The Name on Card field is mandatory, and all other fields are optional. Selecting the Email Receipt checkbox emails a receipt of the transaction to the address provided in the Email Address field. The Store Customer Profile checkbox is selected by default. Unchecking this box will result in the customer's payment profile not being saved for use at a later time. You can manually enter the customer's payment card information in this section of the Virtual Terminal. If you are performing a card-present transaction, clicking swipe/secure key displays a message prompting you to swipe the customer's payment card. Enter the transaction amount in the Amount field. Selecting the Customers tab allows you to easily add new customer profiles to your merchant account, as well as edit existing customer profiles. CardPointe provides the ability to quickly create recurring billing plans for your customers. Billing plans are ideal for subscription-based services, such as fitness club memberships and mobile phone plans, as well as for recurring payment plans, such as auto loans and hospital bills. Click New Billing Plan. 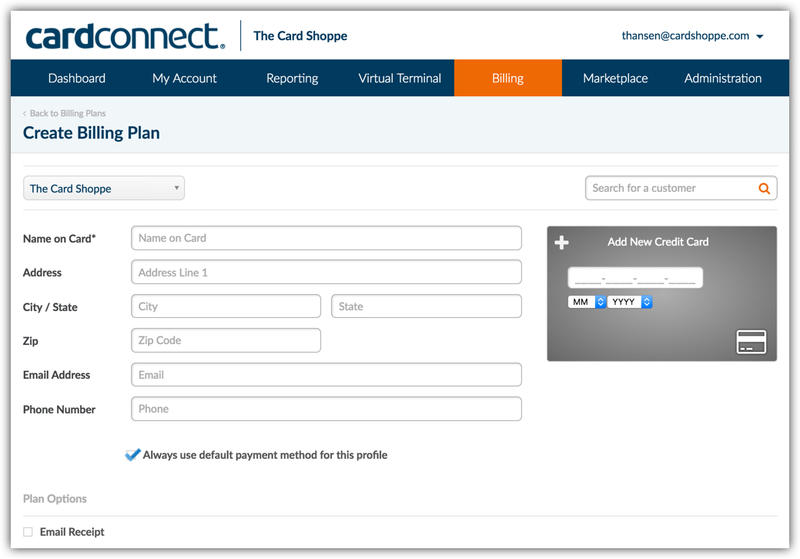 The Create Billing Plan screen displays. If you have multiple merchant locations, select the location that you wish to create the billing plan for. The Always use default payment method for this profile checkbox is selected by default. When this box is selected, the default payment method that is assigned to the customer's profile is used for the billing plan. To edit a customer's default payment method, navigate to Virtual Terminal > Customers tab > select a customer > select a payment method at the right of the screen > click Make Default. In the Plan Scheduling section of the screen, choose the desired billing interval from the drop-down. By default, Monthly intervals are selected as this tends to be the most commonly used billing interval. Choose the billing Start Date. Choose the billing frequency in the Bill Every field. In this example, the customer will be billed on a bi-monthly basis since the Monthly interval is selected, and because the billing frequency entered in the Bill Every field is set to 2 months. Cancelled - The plan will remain active until it is cancelled by the customer. Date - The plan will remain active until a specified date. # of Payments - The plan will remain active until a specified amount of payments are received. Enter a name for the plan in the Plan Name field. Enter the amount owed for the billing plan in the Amount field. 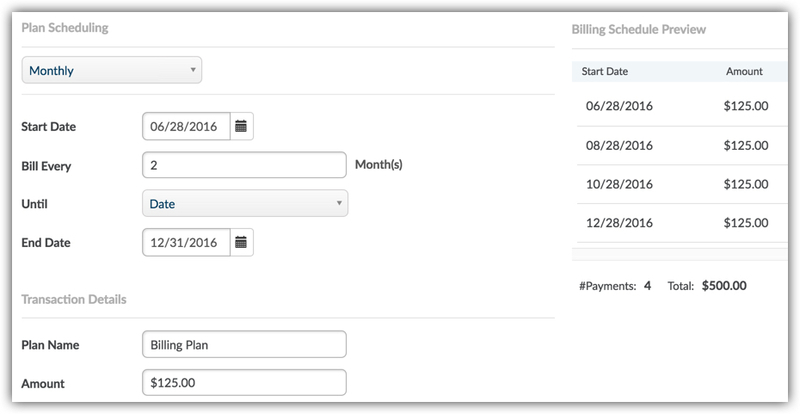 Upon entering a billing amount, the Billing Schedule Preview section displays the number of payments that remain for the billing plan. When finished, click Save to create the billing plan. Easily create products with custom pricing. Assign your products to product categories. Create monetary and percentage-based discounts that can be applied at the product and cart levels when selling with CardPointe Mobile. Note: The CardPointe desktop application allows you to manage your catalog, while the CardPointe Mobile app allows you to manage your catalog and sell your products from the catalog. For more information on using the Catalog in CardPointe Mobile, please click here. Any CardPointe user with access to the Virtual Terminal can also process transactions using the Catalog in CardPointe Mobile. However, for a user to be able to create products, categories, and discounts in both the CardPointe desktop application and in CardPointe Mobile, you must grant the user permission via a setting on the "Administration" screen in CardPointe Desktop. Click Administration in the top nav of the CardPointe Desktop Application. Check the Catalog Admin box. Products are any items that you sell using CardPointe Mobile. The products that you create in the CardPointe desktop application are selectable in CardPointe Mobile on the "Register" screen during the checkout process. Click Catalog in top navigation and select the Products tab. Give the product a name. If the product has a SKU, enter it in the "Product SKU" field (optional). To apply a discount to the product, search for and select the discount in the "Discount" field. Choose whether the product should be "Active." If a product is not active, it will not be selectable on the "Register" screen during the checkout process in CardPointe Mobile. We recommend using this setting when a product is out of stock. Enter a description of the product (optional). You can group your products into product categories to make them easier to manage in CardPointe Mobile. For example, if you sell electronic products, then your product categories might be TVs, speakers, computers, and cables. You may also wish to create product categories for products that are on sale, seasonal items, or for products in a specific size or color. Click Catalog in top navigation and select the Categories tab. Choose whether the category should be "Active." If a category is not active, you will not be able to select the category during checkout when selling with CardPointe Mobile. Select a color to help distinguish the category from others that you create. You must choose a color in order to create the category. Enter a description for the category (optional). Select an existing category from the list on the Categories screen (Catalog > Categories tab). Click the Add/Remove button to assign products to the category. Locate and select the products from the list of available products. You can offer your customers monetary and percentage-based discounts that can be applied against individual products or against all products that are in the cart when selling with CardPointe Mobile. Note: Discounts created in the CardPointe desktop application are immediately available for use within the CardPointe Mobile app. Click Catalog in top navigation and select the Product Discounts tab. Give the discount a name. Choose whether the discount should be applied as a percentage or as a dollar amount. Choose whether the discount should be "Active." 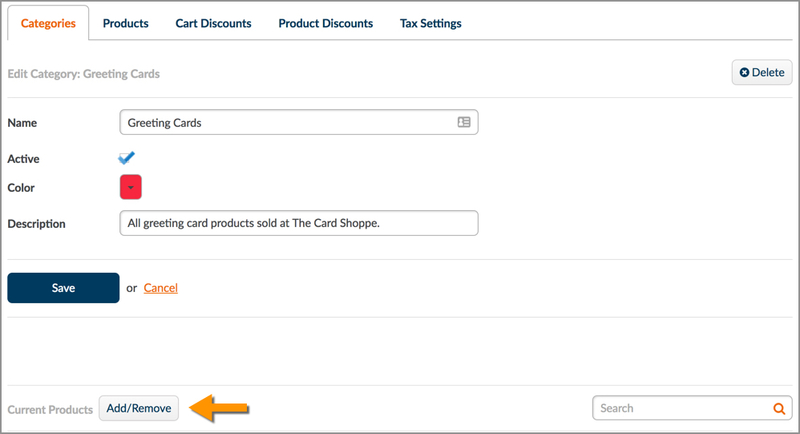 If a discount is not active, it will not be selectable during the checkout process in CardPointe Mobile. Cart Discounts are applied against to the total cost of the items in the cart when selling with the CardPointe Mobile app. Click Catalog in top navigation and select the Cart Discounts tab. CardPointe Marketplace is your one-stop shop for terminals, add-ons and plugins for CardConnect. You can access the marketplace by logging in and navigating to the Marketplace tab. 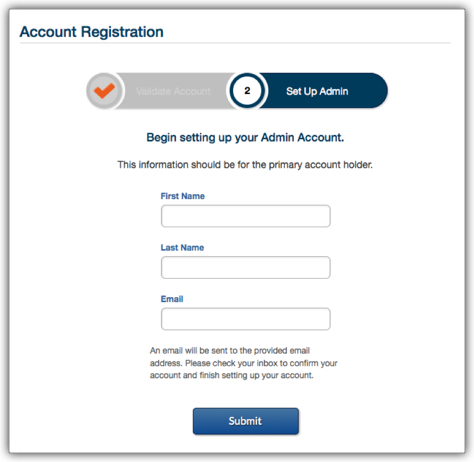 The Administration screen allows you to customize your CardPointe account. 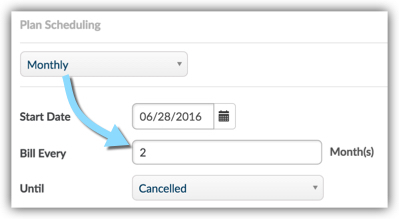 CardPointe allows you to easily configure your batch close-out times. Merchants who process on the North platform (CardPointe, Clover and First Data POS/Gateway only) have the ability to batch out at a later time, while still getting their funds the next day. The batch close-out time that you choose should be no later than 9:50 PM EST in order to receive funds the next day. Navigate to Administration > Batching. Uncheck the box next to "Automatically close batch for Next Day Funding." Hover your mouse over the bar graph and choose a new cutoff time for next day funding. The batch close-out time that you choose should be no later than 9:50 PM EST. Click Save. The bar graph updates by displaying the new batch time for next day funding in blue. Need assistance with CardPointe or have questions about your hardware? We have your back! 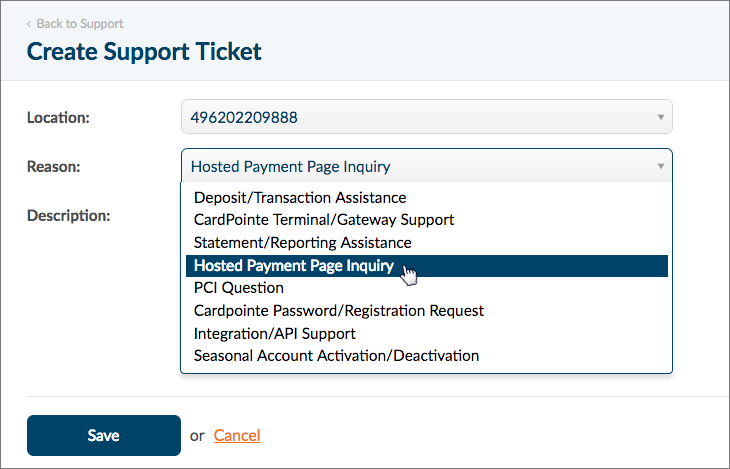 You can contact our Support team by submitting a support ticket without having to leave the CardPointe application. We encourage you to perform a search on this Support site to see if you can find an answer to your question. If this site does not solve your problem, we welcome your feedback with open arms! Simply click the Send Feedback button at the bottom-right of any page on this site to tell us how we can improve your support experience. Who Can Submit Support Tickets? 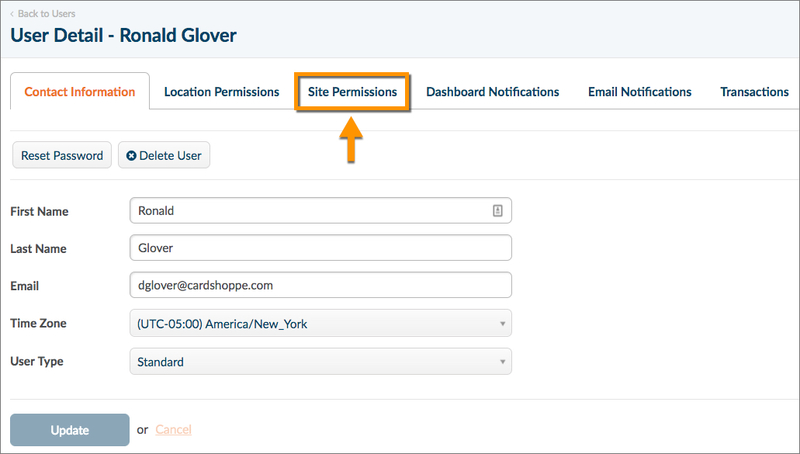 Any CardPointe user with the appropriate permissions can submit Support tickets in CardPointe. By default, "Admin" users have the ability to submit Support tickets. "Standard" users can also submit Support tickets, but they must first have their account permissions updated. Navigate to Administration > Users and select the user that you wish to grant access to submit Support tickets. Scroll down and check the box next to Support Ticketing. Click Update. 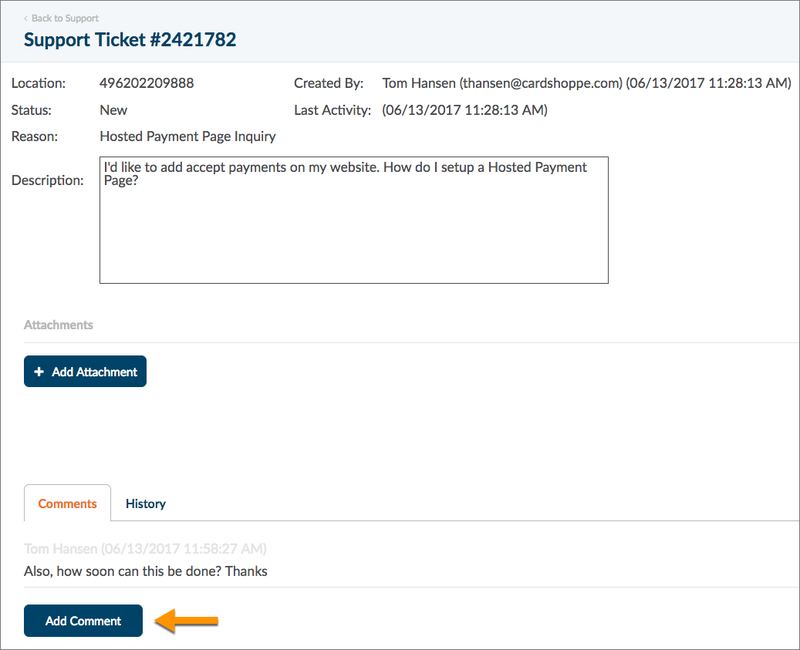 The user now has the ability to create Support tickets in CardPointe. Note: If the "Support Ticketing" option does not display on the "Site Permissions" tab, please contact your Partner for assistance. Navigate to the "Support" tab and click Create Ticket. If you have multiple merchant locations, you can open a ticket for a specific location by choosing the site from the Location dropdown. Select the purpose of the ticket from the Reason dropdown. Provide details about your request or inquiry in the Description field. When finished, click Save to submit the ticket. A member of our support staff will respond as soon as possible. If you would prefer to be contacted over the telephone, please include your contact information in the ticket description. It's easy to add comments to a support ticket and to view a ticket's history. Select the ticket ID from "Support Tickets" list. Click Add Comment to add additional information or to respond to our Support team. 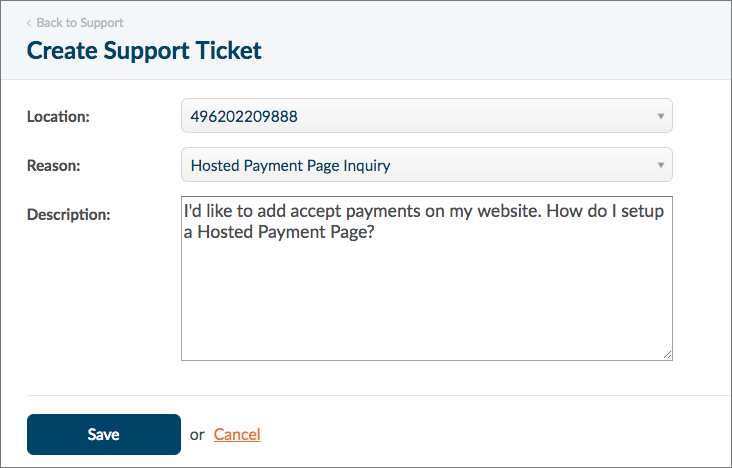 When a Support agent responds to the ticket, their response will appear in the list of comments. You can view the history of a ticket by clicking the History tab. Note: In order to ensure a quick response time, please refrain from opening more than one ticket on the same topic. Want to be in the know when an update occurred to one of your Support tickets? You can opt to receive email notifications whenever a Support ticket is created or updated on your merchant account. 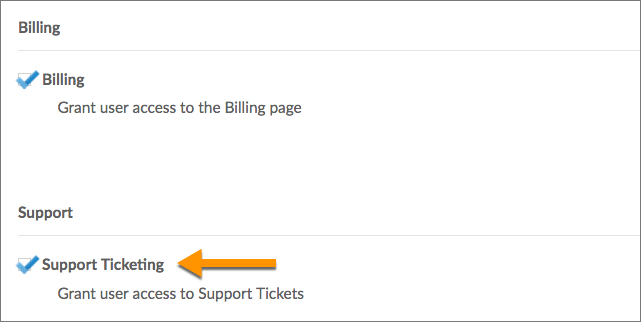 Navigate to Administration > Users and select the user that you wish to subscribe to ticket updates. Scroll down to the "Transactions & Event Notifications" section and check the box next to Support Ticket Alerts. Click Save when finished. You will now receive email notifications when support tickets are created and updated. What is this fee on my statement? See below for a list of fee definitions. Transaction Fees Charged for each settled transaction. Transaction fees are assessed on both sales and refunds. Application Fee (One Time) Fee charged to submit and process a merchant services application, or to cover the cost of a 3rd party gateway or software product, such as Authorize.net. Regulatory Product Fee (Monthly) Monthly fee assessed to cover the cost of producing the 1099 forms required by the IRS for every merchant. PCI Annual Fee Annual fee to cover the costs of the processor to maintain full PCI compliance. Wireless Fee (Monthly) Monthly fee to cover GPRS terminal cost for cellular service. Wireless Activation One-time activation fee to cover GPRS terminal setup cost and SIM card. What do these declines mean? Each decline comes with a code to help you understand why the error is happening. These decline codes are universal, and can be found by simply entering the code into your preferred search engine. Who can help me after hours? Merchants can call 877.828.0720, for after-hours support. Just press Option 1 then Option 2 to reach a live representative. What are the next day funding cut off times? Check out our article on Configuring Funding Batches. How do I void/refund a transaction? Merchants can void or refund a transaction done by a CardPointe terminal or device by going to the Virtual Terminal on the CardPointe platform. A button to Void or Refund the transaction displays under Transaction Detail. If a merchant is using a 3rd Party Terminal, you will need void or refund at the terminal. If you still need help, please call 877.828.0720. How can I change my demographic information in CardPointe? 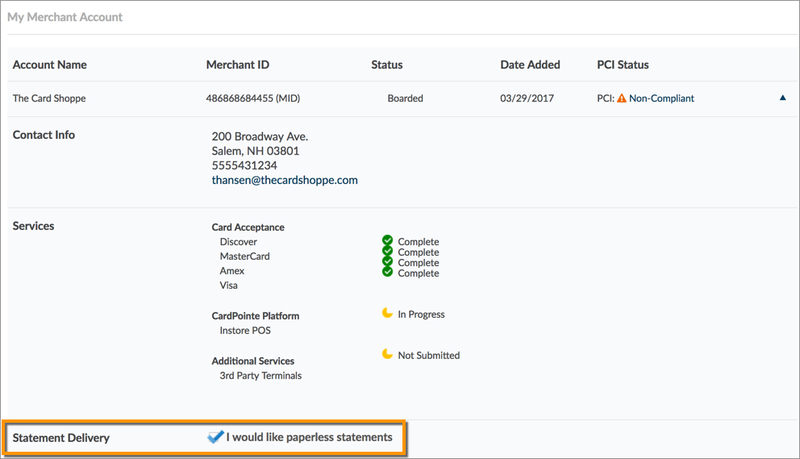 Merchants can access the options to change their receipt information by going to Administration > Receipts subtab. How can I reconcile my funding vs my transactions? 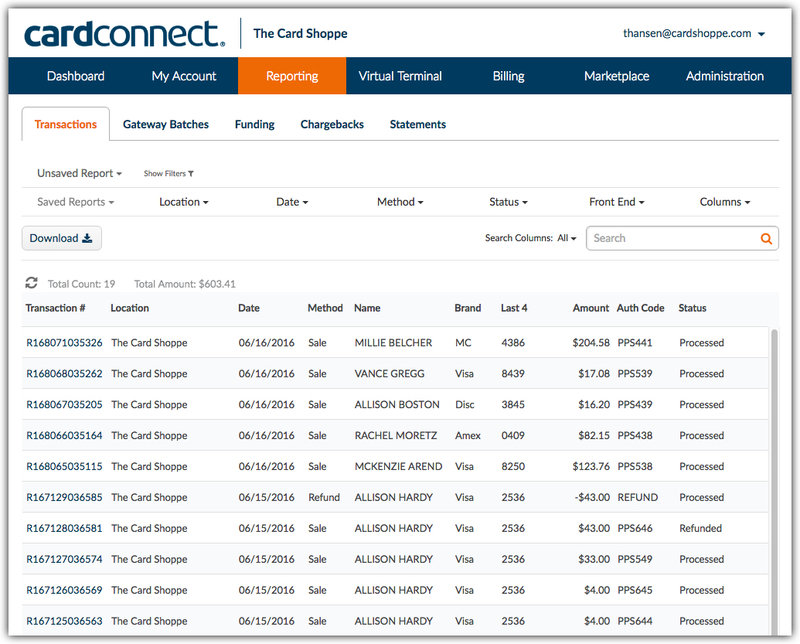 You can access the record of all of your transactions under the Reporting tab in CardPointe. If you feel something is incorrect, please call one of our Merchant Solutions representatives for an answer. What is the difference between funding summary and a batch report? A batch report shows each transaction done in a particular time frame. A merchant can either batch automatically each day at a certain time, or batch manually at their terminal. A funding summary is what actually goes into the merchant’s bank account. This can be comprised of multiple batches, like after a weekend, and can also include debits from the account, like fees or charges taken out. Where can I see my statements? Your statements are accessible under the Reporting > Statements tab. From there, you will be able to see all of your statements from any linked Merchant Identification numbers. What is PCI compliance and how do I become PCI compliant? The Payment Card Industry Data Security Standard (PCI DSS) is a set of industry rules passed down by the major card brands to protect merchants and customers from data breaches and identity theft. All merchants must be compliant, or risk facing a fine from the card brands. As a CardConnect merchant, your PCI compliance status is determined by your standing in Trustwave’s Trustkeeper portal. You can access this portal under the My Account tab on your CardPointe account.